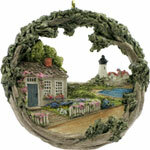 Martha's Vineyard, Massachusetts, AmeriScape ornament. Each ornament is a hand-painted relief sculpture by Hestia Creations and is gift boxed with a ribbon for hanging. Ornament shows the Edgartown Ferry transporting a car to Chappaquiddick Island. Size 3.5" diameter.